Citation Information: J Clin Invest. 2003;111(6):805-810. https://doi.org/10.1172/JCI13603. Among infectious agents, measles virus (MV) remains a scourge responsible for 1 million deaths per year and is a leading cause of childhood deaths in developing countries. Although MV infection itself is not commonly lethal, MV-induced suppression of the immune system results in a greatly increased susceptibility to opportunistic bacterial infections that are largely responsible for the morbidity and mortality associated with this disease. Despite its clinical importance, the underlying mechanisms of MV-induced immunosuppression remain unresolved. 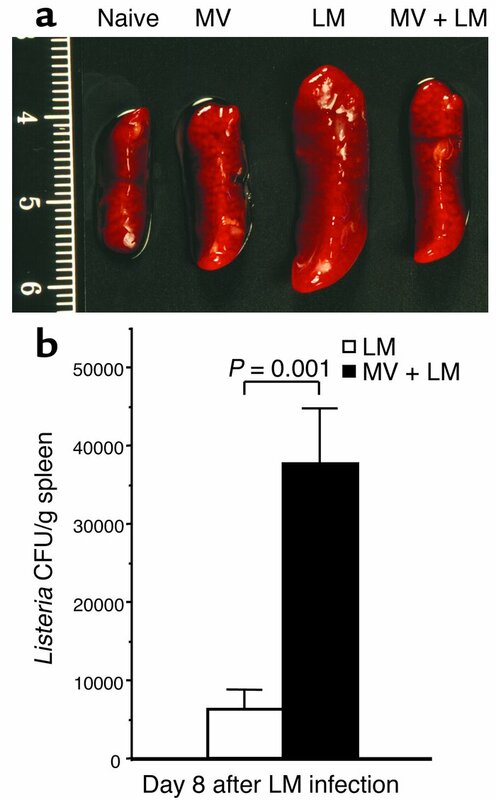 To begin to understand the basis of increased susceptibility to bacterial infections during MV infection, we inoculated transgenic mice expressing the MV receptor, CD46, with MV and Listeria monocytogenes. We found that MV-infected mice were more susceptible to infection with Listeria and that this corresponded with significantly decreased numbers of macrophages and neutrophils in the spleen and substantial defects in IFN-γ production by CD4+ T cells. The reduction in CD11b+ macrophages and IFN-γ–producing T cells was due to reduced proliferative expansion and not to enhanced apoptosis or to altered distribution of these cells between spleen, blood, and the lymphatic system. These results document that MV infection can suppress both innate and adaptive immune responses and lead to increased susceptibility to bacterial infection. Concurrent MV infection impairs the clearance of LM from the host. YAC-CD46 transgenic mice were either untreated (naive), infected with MV alone, infected with LM alone, or infected with MV and 5 days later coinfected with LM. (a) LM-induced splenomegaly is reduced during acute MV infection. Representative spleens were photographed 8 days after LM infection (i.e., 13 days after MV infection). Based on 6 to 21 samples per group, the average spleen weights (± SD) were as follows: naive, 0.13 ± 0.02 g; MV, 0.18 ± 0.06 g; LM, 0.40 ± 0.15 g; and MV and LM, 0.29 ± 0.09 g. Concurrent infection with MV and LM resulted in significantly reduced splenomegaly as compared with LM infection alone (P = 0.009, Student’s t test). The scale on the left side of the figure is in centimeters. (b) Five days after MV infection, YAC-CD46 transgenic mice were coinfected with LM, and bacterial titers in the spleen were compared with those of mice that received LM in the absence of MV infection. Eight days after LM challenge, there was a sixfold increase in LM CFUs/g of spleen in mice concurrently infected with MV. This difference is statistically significant (P = 0.001, Student’s t test), indicating that coinfection with MV resulted in an increased persistence of bacteria during secondary infection. The results show the average (± SEM) of six mice per group. Equivalent results were observed in two additional experiments.